In addition to our terrific projects AND a beautiful favor that Oksana made for all of us, I received this beautiful thank you card that Oksana used real coffee to paint . Brilliant!!! I love Oksana's creations and encourage you to enjoy her blog as well! Here are the cards we made at Oksana's workshop. I just love the colors and beautiful little touches! Here is the beautiful favor that Oksana made for all of us, complete with delicious chocolates, of course. I must CASE this for sure!! Here is her sweet thank you note that painted using actual coffee. Yes, she is definitely brilliant and creative!! Here are our class cards for this week. The Art Gallery Stampers, Titusville Stampers and the SOS Stamp club all did a great job with these cards. Such fun I've had!! 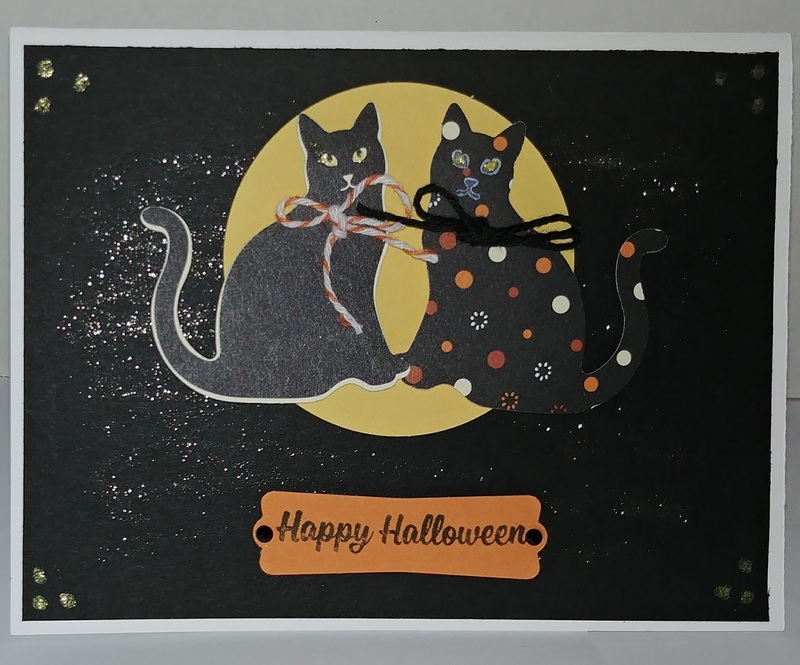 Love our Halloween kitties! We had fun with the leftover tails and cat faces peeking in on the inside of the card. And here is the secret code word "kitties". The first to email it to me will receive a vintage stamp set. I imagine you're all on to me now. :-) Ugh!! I should have added some additional lighting for this photography session!! Have a wonderful weekend and enjoy the new catalog. Please feel free to email me if you have no demonstrator and I will be happy to send you a Holiday Catalog free of charge! !